Oh oh, this is pretty! I love this card! I was inspired by my vellum overlay on last week’s floral card and decided to see what it would be like if I stamped a whole piece of cardstock and then covered it all up! I know, I know, it sounds nuts, but actually, with the colour reflected on the Bloomin’ Heart die cut shapes and then the same colour stamped but softened with the vellum, it actually works really well. 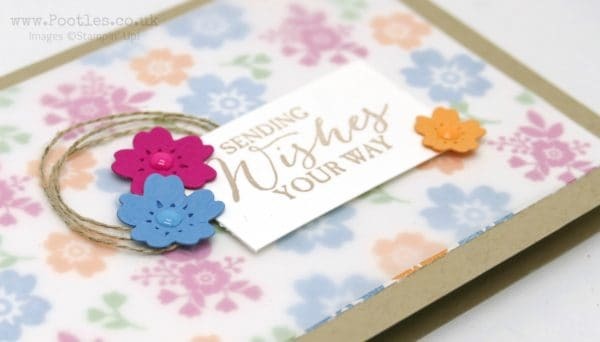 My colours for the flowers in the background and on the die cuts are Melon Mambo, Peekaboo Peach and Marina Mist, then there’s a scattering of leaves in Pear Pizzazz too. I love this set of colours! So finally, I have a sentiment that I took from Butterfly Basics and a twist of linen thread and tra la! Card made. I know that Vellum cardstock can be problematic to adhere, so my glue is all hidden behind the flowers and the sentiment piece. So who’s up for trying this technique out? I will try!! The card is so pretty!! 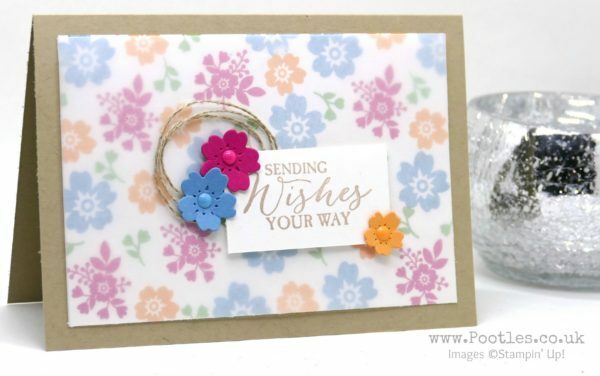 Have you tried gluing velum with Tombow? Use a small sponge to pick up the glue and bounce it thinly onto the velum. It gets sticky and clear. Not my idea, just passing info on.